Posted May 20th, 2017 by Mike Boyes & filed under Interpersonal Attraction Close Relationships, Motivation-Emotion, Social Psychology, Stress Coping - Health. Description: Do you love your smart phone? I mean really love your smart phone? Or perhaps think about it another way. How does your use of your smartphone over the course of a typical day impact your primary relationship(s)? If you are not sure about this think about people you have seen together at movies, restaurants or other public venues. What about them and their phones and their relationships? Once you have a hypothesis or two have a look at the article linked below to see what clinicians and research Psychologists have found or have to say about this question. Smartphones can do many things for us but they also demand a fair bit of our attention and in doing so they often threaten (or succeed in taking us away from our immediate face-to-face interactions. When those interactions are with our loved ones, significant others etc. there can be negative consequences for our relationships. 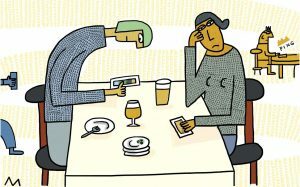 The link to the “Smartphone Compulsion Test” near the end of the article will provide you with some general feedback as to whether this might be a problem or a potential problem for you. While escaping from the “here and now” may be a good thing to do some of the time it is NOT a good thing to do when interacting with a friend, lover, or significant other and especially not a good thing to do regularly. In one study 70% of women stated that smartphone use was negatively impacting their relationships (and this is especially important to note as women are more likely to be the first in a relationship to notice that it is not going well). The article suggests some relationship saving steps well worth considering in relation to your smartphone use. How might smartphone use impact a close relationship? Why might smartphone use have negative impacts on relationships (in terms of the sorts of things that build or strengthen relationships)? Why might the suggested relationship saving or preserving steps of smartphone use be helpful?